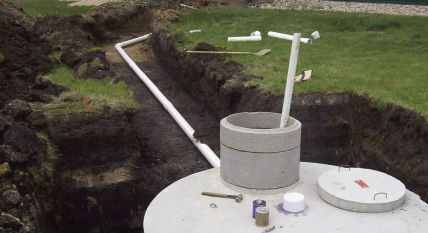 Why Replace A Failing Septic System? It is unhealthy for humans, pets and wildlife to drink or come in contact with surface or groundwater contaminated with sewage. Inadequate treatment of sewage allows bacteria, viruses and other disease-causing pathogens to enter surface and groundwater. Hepatitis, dysentery and other disease may result from bacteria and viruses in drinking water. An inadequately vented septic system may release toxic gases into the home, disease-causing organisms may make lakes or streams unsafe for recreation and flies and mosquitoes that are attracted to and breed in wet areas where sewage reaches the surface may also spread disease. Inadequate treatment can also raise nitrate levels in groundwater which is a special risk to infants. *Foul odors in your home or yard. *Wet, spongy ground or lush plant growth that appears near the septic tank or drain field. *Fixtures in the house drain slowly - caused by clogs in the house, septic tank or drain field. The state of MN and Rock County does not require a septic inspection upon the sale of property. Should a lender require an inspection, we have two licensed septic inspectors on staff to assist you. program offers a 5 year loan at 3% interest in which the landowner works with local banks. The first step to acquiring this loan is to contact the Land Management Office to have funds allocated at 3% interest. Contact the Land Management Office for further information at 283-8862 Ext. 4.